One of the deadliest pandemics in history, the influenza of 1918-19 killed tens of millions of people  more than the number of those who perished in all of World War I. 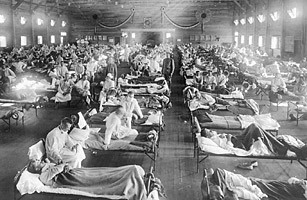 The Spanish flu (as it was known) infected an estimated one-third of the global population and hit young adults especially hard, sweeping over the planet in waves. Victims died quickly and painfully. As TIME wrote in "A Brief History of Flu Pandemics," "Undertakers were so overwhelmed that corpses were left inside homes for days. Cities passed laws requiring citizens to wear masks in public places, but the virus defeated that barrier. ... When autopsies were performed on flu victims, lungs were found to be blue and sodden. They had died by drowning."